biology 101, biology and behavior, biology matters, civic society, civicness, different peoples is different (duh! ), eastern europeans, europe, europeans, mating patterns matter, poland, polish people, relatedness matters, what's this hbd business all about anyway? 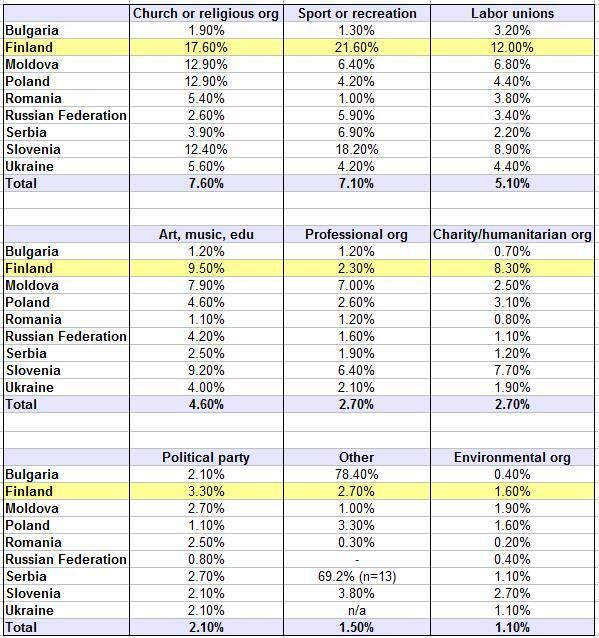 in two posts last year (here and here) i looked at the uncivicness of eastern europeans, civicness being determined by looking at data from the world values survey regarding membership in volunteer organizations. in those posts, i looked specifically at active members — people who are not just card-carrying members but who actually regularly participate in voluntary activities. szopeno referred me to a very interesting research article — Civil Society Weakness in Post Communist Europe: A Preliminary Assessment [pdf] — in which the argument is made that some of the post-communist european countries are more civic than others. in other words, a population having experienced living under a totalitarian, stalinist regime is not the only explanation for subsequent uncivic behavior. the authors point out, for instance, that former soviet central asian countries are, for the most part, much less civic than anything you find in eastern europe. needless to say, they didn’t consider that central asian societies are generally first-cousin marrying, tribally-based populations whereas the majority of eastern europeans are not either of those, but that’s a discussion for a later date. by using the data in table 1 on page 3 — and via the magic that is google translate — i’ve been able to compare this polish survey of volunteerism with the world values survey. i thought it would be a good way to check to see if the world values survey is right at all. the majority of the results of the comparable categories in the world value survey and the polish survey are within three percentage points of each other. that’s very close. one is quite off — interestingly, church/religious organizations — with a difference of 9.5%. and then there is the “other” category. there were lots of types of organizations that were asked about on the polish survey that weren’t touched upon at all on the world values survey, and i can imagine that many people just didn’t think to mention them as “other” when they were taking the world values survey. so, in the polish survey, there is an additional 21.4% of “yes” responses than on the world values survey. that sounds like a lot — and it IS a lot — and it certainly raises poland quite a bit above the average scores from the arab world. however, poland still scores really low compared to anglo countries, for instance great britain. if we add together all the percentages of the “yes” responses for poland from the world values survey, we get 37.8%. adding together all the percentages of “yes” responses for poland from the polish suvey, we get an improved 51.7%. but, if we add together all the percentages of “yes” responses for great britain from the world values survey, we get a whopping 143.5%. the two countries are just not in the same league. so, i think that even if the world values surveys underestimate the true civic participation rates for some or all of the countries involved, they still offer a pretty accurate picture of how civic different populations are relatively speaking. don’t get the wrong idea, though. lower civicness doesn’t necessarily mean that a population is overall less caring or less kind or less helpful. it’s just that, i think, their energies are directed differently. in the arab world, for instance, i’m sure that individuals are helping out and working with others plenty — it’s just that they help out and work with family members more so than strangers. and the latter is (mostly) what civic organizations are all about. biology 101, biology and behavior, biology matters, different peoples is different (duh! ), europe, europeans, mating patterns matter, poland, polish people, relatedness matters, what's this hbd business all about anyway? – during this time period (1500s-1700s), marriages in the upper classes in the city of gdańsk on the baltic coast were arranged and clan relationships were taken into consideration by those making the arrangements. a lot of these people would’ve been immigrants from germany. – in the city of warsaw in central poland between 1740-1779, most marriages occurred in the local community. since this is a city, however, some amount of the individuals (or their families) were probably immigrants from the countryside. dunno how many. ca. 3% of marriages were mixed catholic-protestant. – in the town of toruń in north-central poland, marriages from outside the town were rare as well as was migration into the town. – between 1641 and 1800 in the small town of brzeżany, which today is located in the ukraine, marriages were very local and migration into the town was rare. most marriages were between members of the same faith (catholic or greek orthodox). – the peasants of upper silesia, which is in the center of poland, were usually stuck in feudal relationships, so their marriages were “territorially endogamic” — so probably biologically endogamic as well — and in many areas of upper silesia they became even more so during the time period (1500s-1700s). so, most marriages in the 1500s-1700s in poland were local, but the populations themselves in towns and rural areas would’ve been more local than in larger urban areas. “The bride and bridegroom mostly came from the territory of the Roman Catholic parish of Brzeżany, some of them from an unknown location, and the rest from very distant places. According to the available public marriage registers (both Roman and Greek Catholic) 67.8% of men and 74.2% of women came from the Brzeżany parish, 20.2% of men and 21.5% of women from an unknown location, and 12% of men and 4.3% of women from outside the parish. “The bride and the bridegroom usually came from the same place, where they also lived after the wedding, i.e. those living in a town also came from that town, those from a suburb lived in the same suburb, and of course those from a certain village lived in that village. Newcomers from other places were a minority. The migration from the country to the town in the analysed parish was very small. “In Silesia, if a marriage resulted in leaving the village and an extinction of the feudal relationship, a special contribution had to be paid to the landowner…. late medieval/early modern polish rural society, then, was clannish. szopeno, who has shared a lot of great info about marriage and the family in historic poland over the last couple of days (thanks, szopeno! ), suggests two things that might’ve served to decrease inbreeding in poland during this time period: wars and zbiegostwo. wrt wars, szopeno means that soldiers passing through regions would’ve left some of their genes behind in the population. absolutely! and, unfortunately, there certainly weren’t a shortage of wars in poland during these centuries. the only thing about wars, though, is that — not surprisingly — they tend to make people close ranks. for example, inbreeding (close cousin marriages) in italy increased following both world wars, so it’s hard to know what the total effects of a war(s) on a gene pool might be. where did these people go? did they wind up in other (hopefully better) feudal positions? they don’t seem to appear much in the marriage records of toruń or brzeżany or upper silesia (see above). maybe they wound up in big cities like warsaw. then the question is, how successful at mating and leaving progeny behind were the lower classes in late medieval/early modern urban center in poland? presumably not very, but i really don’t know. open question. SOME of them are believed to have joined up with the cossacks! now there’s an alternative lifestyle for you. (~_^) no idea how many fleeing peasants wound up doing that. i think the first part there — a nation losing its best and brightest — will definitely have a negative effect on society, possibly for quite a few generations. but i don’t really buy that there would be long-lasting effects on a nation’s psyche (unless there are some sorts of epigenetic effects of living in stressful circumstances 24/7 for decades?). i think there’s something deeper going on wrt “civicness.” i have a hard time believing that it’s just a coincidence that regions as diverse as the arab world and eastern europe and spain and italy — all places with a long history of you-know-what — have low scores on civicness. 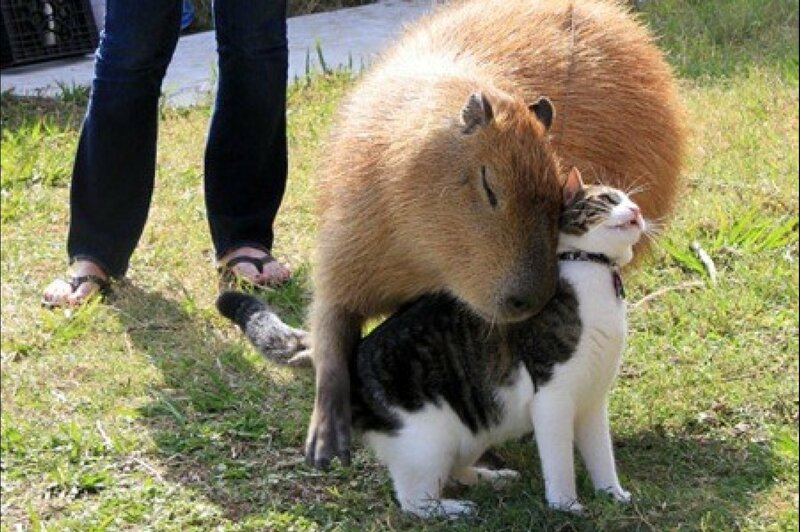 i think there’s something biological going on. szopeno also suggested that “civicness” might be different in eastern germany than in western since the population in the east was under a totalitarian regime for so long. so, i’ve taken a closer look at “civicness” in west and east germany and in poland. Please look carefully at the following list of voluntary organisations and activities and say…which, if any, do you belong to? i’ve used the ’99 survey because it breaks down the responses by region, whereas the later surveys unfortunately do not. for germany and poland, the data are broken down by the sixteen german länder and the sixteen polish voivodeships. the questions are slightly different from the 2005-2008 wave, but some of them are the same. in my previous post, though, i considered “active” members; the 1999 wave options were basically just member or not member. note that some of the sample sizes for some of the regions are rather small. i should’ve cleaned those out, but didn’t have (make!) the time right now, so consider this post a rough draft! 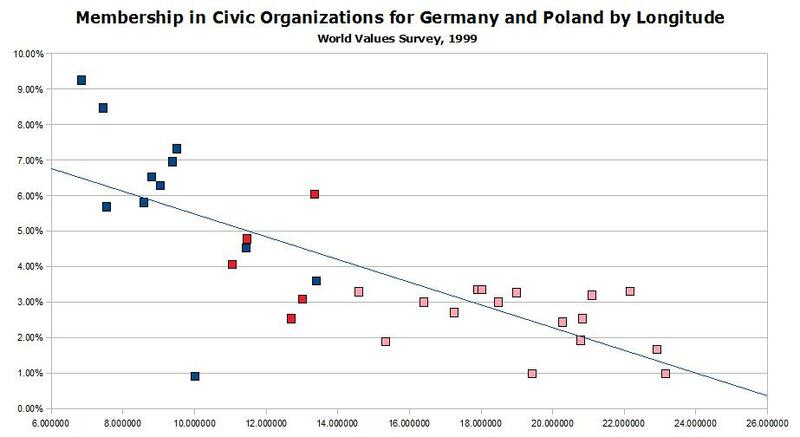 so, at least across germany-poland, there is a general west-to-east decrease in civicness. however, when i checked for correlations between civicness and longitude within each of the countries, while i found a negative 0.66 (-0.66) correlation in germany, there was only a negative 0.39 (-0.39) correlation in poland. so, uncivicness seems to be present across the board in poland, but runs from west-to-east in germany. never fear! i’ll be looking more at mating patterns and family types in poland (and eastern europe) — and there are other sources on “civicness” in poland to be looked at — so stay tuned! btw, that blue dot with the 1% (0.93%) average responding that they were members of some sort of voluntary organization? that’s hamburg. the number of samples was on the low side for hamburg, but if the survey results are at all correct, the only “odd” thing i can think of regarding the city is that it is a rather vibrant one. i suspect it might be the low numbers, though. the highest scorer — pretty much as far to the west as you can get in germany — was saarland with nearly one in ten saying that they belonged to some sort of voluntary organization. i had a post up a few months ago about mating patterns in medieval eastern europe which i said at the time was just a preliminary view on that whole region of the world since eastern europe is a pretty big place and i want to look at the mating/family patterns for that whole region from at least the early medieval period up until today (*whew! – hbd chick wipes brow*). here goes another post on part of the region — poland — which, again, should just be viewed as an initial peek at what’s been going on mating-wise in that part of the world over the past several hundreds of years. szopeno left a comment on the previous post the other day saying that the zadruga, which i had mentioned in the post, is/was mostly just a southern slav thing and not a western slavic institution. “[A] type of rural community historically common among South Slavs…. Originally, generally formed of one family or a clan of related families, the zadruga held its property, herds and money in common, with usually the oldest (patriarch) member ruling and making decisions for the family, though at times he would delegate this right at an old age to one of his sons…. The zadruga eventually went into decline beginning in the late 19th century, as the largest started to become unmanageable and broke into smaller zadrugas or formed villages. However, the zadruga system continues to color life in the Balkans; the typically intense concern for family found among South Slavs even today is partly due to centuries of living in the zadruga system. Many modern-day villages in the Balkans have their roots in a zadruga, a large number of them carrying the name of the one that founded them. so that’s the southern slavs. what about the western ones? – in particular the poles? so the nuclear family is relatively new in poland — the first partition of poland was in 1772, so 1770s until 2010s that’s ca. twelve conservative generations (a generation equalling twenty years). i don’t know if that qualifies as a zadruga, but the poles were definitely living in communal family arrangements in the middle ages. “[O]n the whole peasant societies are geographically relatively immobile. In the context of Poland, for example, this is taken for granted, our authors only alluding to it in asides. Thomas and Znaniecki suggest that one reason for the absence of romantic love is that it is psychologically impossible because ‘in most cases … all the possible partners are known from childhood.’ Galeski refers to the ‘marked spatial stability’ of the inhabitants of villages, stating that it is ‘a characteristic of the village community that the persons living in it are connected primarily by social, but also by territorial origin. They were usually born in the village or in a neighbouring village….’ The idea that people should spend their lives in half a dozen villages, or move from village to town and then back to the village is largely absent. Most of those who live in a community pass through all the major phases of their life in one area among a group of people they know from cradle to grave. Many of those around them are neighbours, but many are also kin, for one consequence of limited geographical immobility and an association between land and family is that territories fill up with kin…. so, from around 1000 to 1500, poles were mostly living in community family groups. i’m not sure what happened after 1500, but it sounds as though extended families and strong family ties lasted well up and probably into the 1800s. what i don’t know is what the mating patterns of poles were historically. did they marry cousins? the russians did from time to time, but hey — that’s the russians. the poles became roman catholics in 966, so they ought to have followed all the church’s bans on cousin marriages. but being catholic and marrying cousins never bothered the irish much and, of course, dispensations have often been available (southern italians have very frequently married their cousins up until quite recently). from galeski we learn that, at the very least, marriage was pretty endogamous amongst polish peasants. sounds like the poles are more like the greeks than the english or the medieval rural northern italians. well, not just personal contacts but genetic relatedness. most of a polish peasant’s relationship were with immediate family, extended family, or distant family. as macfarlane said, territories pretty quickly fill up with kin. update 04/18: i don’t have access to this dissertation, but it looks like a good deal of medieval poles paid little heed to the church’s regulations on marriage. not surprising. several other medieval (and modern!) european societies did the same (egs. the italians, the irish).